236 pages | 36 B/W Illus. 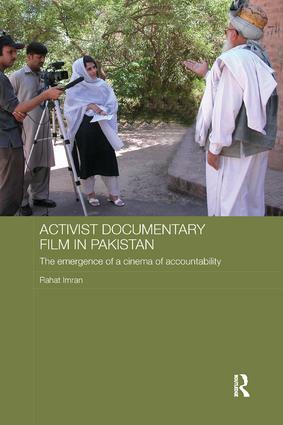 This book, the first academic book on Pakistani documentary cinema, traces the development of activist filmmaking practices in Pakistan which have emerged as a response to the consequences of religious fundamentalism, extremism, and violation of human rights. Beginning with the period of General Zia-ul-Haq’s Islamization process (1977-88), it discusses a selection of representative documentary films that have critically addressed and documented the various key transformations, events, and developments that have shaped Pakistan’s socio-political, socio-economic, and cultural history. Such activist filmmaking practice in Pakistan is today an influential factor in addressing the politics, and negative and oppressive effects of the Islamization era, discriminatory laws, particularly gender-discriminatory Sharia laws, violation of human and citizen rights, authoritarianism, internal strife, the spread of religious fundamentalism, and the threat of Talibanization, and oppressive tribal customs and traditions. The contribution of Pakistani documentary filmmakers stands as a significant body of work that has served the cause of human rights, promoting awareness and social change in Pakistan, particularly regarding gender rights. Rahat Imran holds a PhD in Cinema Studies from the Simon Fraser University, British Columbia, Canada. She has held a Post-doctoral Research Fellowship in the Department of Film Studies, Media Studies, and Media Education at the University of Bremen, Germany. Currently, Dr. Imran is affiliated with the Institute of Social and Cultural Studies, University of the Punjab, Lahore, Pakistan. She is completing her second book on Comparative Cinemas.